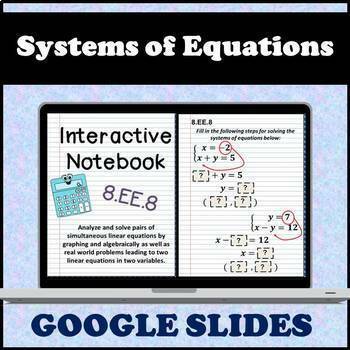 This product is a digital interactive notebook using Google Slides. Students will be able to learn about solving systems of equations by graphing, substitution, and elimination through guided instructions and example problems. 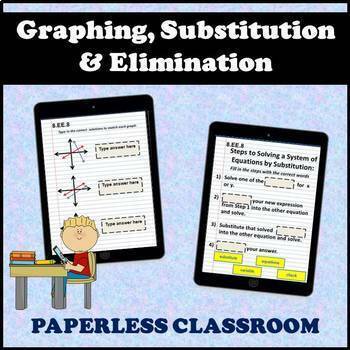 This ELIMINATES the use of paper, scissiors, and glue which provides more time for practice & instruction and helps students with technology fluency. 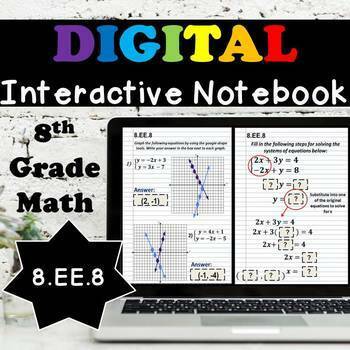 Your students will enjoy using the digital aspect of notes instead of having to take them by paper, plus no more lost notes! 8.EE.8 - Analyze and solve pairs of simultaneous linear equations by graphing and algebrically as well as real world problems leading to two linear equations in two variables.